Poitiers is a city in western France. Its population is over 92 thousand people. Poitiers is situated in Seuil du Poitou. This is a shallow area that connects Aquitaine Basin with Paris Basin. Poitiers was founded by Celtic tribes Pictones - they called it Opidum Lemonum, before the Romans changed it. It is believed that the town's name derives from the Celtic word for elm - Lemo. Roman influence let it become known as Pictavium. The Romans built three aqueducts in town. This extensive complex of Roman citizens indicates that the city had a particularly important status as a settlement. You can even see that it was the capital of the Roman province of Gallia Aquitania in the second century. In the third and fourth century when Christianity became the official religion of the Roman Empire, the first bishop of Poitiers, Saint Hilarius baptized the inhabitants of the city. In the fourth century around Poitiers is built a solid wall 10 meters high and 2.5 kilometers long and its height varies naturally, protecting the eastern side and the tops of the projections. At that time the city became known as Poitiers in honor of its founders – the Pictone tribe. Fifty years later, it fell into the hands of the Aryan Visigoths and became one of the main residences of their kings. In most of the early Middle Ages, the strategic location and protection of Poitiers, which is far from the center of the Frankish power was a big advantage. The battle of Poitiers takes place on September 19, 1356 during the Hundred Year War. In 1418 the royal parliament moved from Paris to Poitiers, where it remained in exile until 1436. The University of Poitiers was founded in 1431. In the nineteenth century were built many military bases in the central city because of its strategic location. Although located a great distance from the borders of France, it became a garrison city. During the bombings of the Second World War, it was particularly hard hit. Today, Poitiers is a city that attracts tourists. There are many attractions. 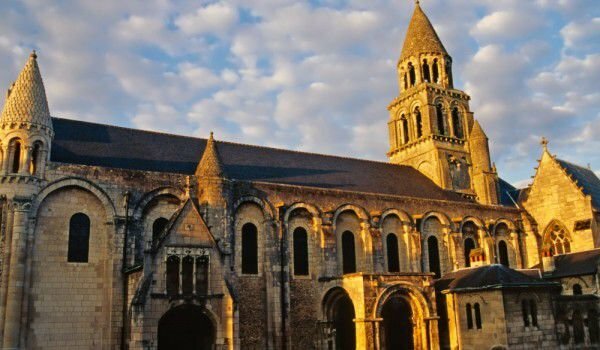 Église Ste-Radegonde church was built in the eleventh century in honor of the patroness of Poitiers - Radegonde, wife of the Frank King. The black marble sarcophagus, with its remains, is found in the tomb of this building. The Museum St-Croix is built on the site of the monastery St. Croix. Among the exhibits is located the Department of Fine Arts, devoted almost entirely to art. Most of the paintings here are focused on Flemish and Dutch art, covering the period from the sixteenth to the eighteenth century. Cathedral of St-Pierre was built by the English King Henry II in 1162 on the ruins of the Roman basilica. Il Baptisterio St-ean is the most ancient Christian monument in France. Construction begins with Roman foundations in the fourth century, and then continued to the seventh century. Inside you can see paintings dating from the eleventh century, and a collection of funeral sculptures. Palais de Justice, the magnificent municipal building, is a place where several important historical events started. Here was done the interrogation of Joan of Arc by the French government court. This is also the place where in 1170 Richard The Lion Heart was named Count of Poitou and Duke of Anjou.